In Washington DC, a throne … | Best Road Trip Ever! A government worker named James Hampton built it secretly in his garage using discarded pieces of foil, burned-out light bulbs, straight pins and jelly jars. 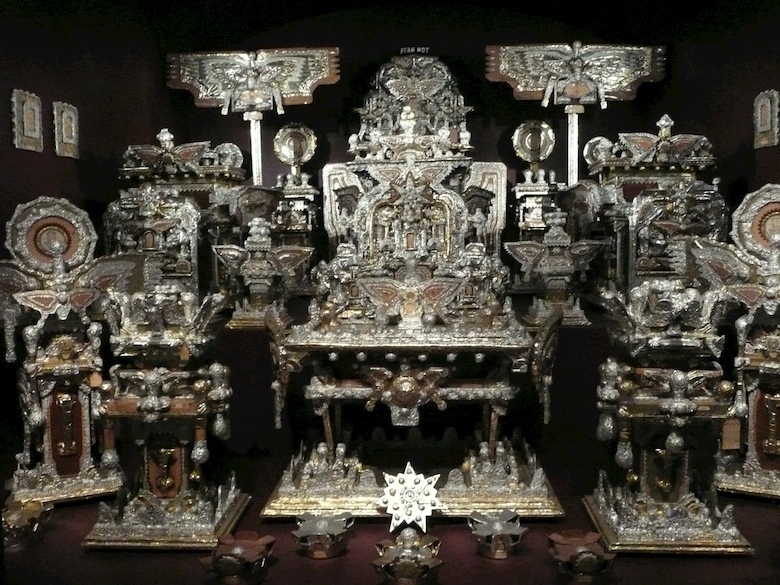 The throne is now in the Smithsonian American Art Museum, along with an impressive outsider and visionary folk art collection. 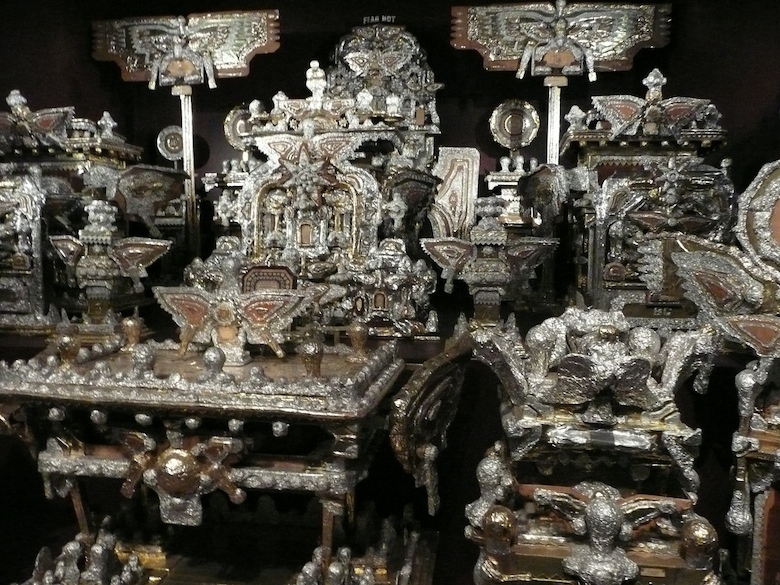 James Hampton’s entire artistic output is this single work which he called The Throne of the Third Heaven of the Nations’ Millennium General Assembly. Hampton worked for more than fourteen years on his masterwork in a rented garage, transforming its drab interior into a heavenly vision, as he prepared for the return of Christ to earth. The Throne is his attempt to create a spiritual environment that could only have been made as the result of a passionate and highly personal religious faith. Hampton’s full creation consists of 180 components—only a portion of which are on view. The total work suggests a chancel complete with altar, a throne, offertory tables, pulpits, mercy seats, and other obscure objects of Hampton’s own invention. His work also includes plaques, tags, and notebooks bearing a secret writing system which has yet to be, and may never be, deciphered. Hampton’s intricate, large-scale design for The Throne derives coherence from parallel rows of constructions, densely packed on several levels. A seven-foot tall cushioned throne at the rear center is the work’s focal point. Pairs of objects on either side of it impart a powerful, compulsive sense of symmetry. To the actual throne’s right, objects refer to the New Testament and Jesus; to the left, the Old Testament and Moses, a division that corresponds to the disposition of the saved in the Bible. Every item has a relationship to the others and most bear a dedication to a saint, prophet, or other biblical character that may have appeared in the recurrent visions that inspired Hampton’s efforts. Massive wings, suggesting angels, sprout from most components; framed tablets line the walls, and crowns and other complex foil decorations fill every available space of the assemblage. The entire complex was originally placed on a three-foot tall platform set stage like against the rear wall of his garage. The Throne and all of its associated components are made from discarded materials and found objects consisting of old furniture, wooden planks and supports, cardboard cutouts, scraps of insulation board, discarded light bulbs, jelly glasses, hollow cardboard cylinders, Kraft paper, desk blotters, mirror fragments and electrical cables and a variety of other “found objects,” all scavenged from second-hand shops, the streets, or the federal office buildings in which he worked. To complete each element, Hampton used shimmering metallic foils and brilliant purple paper (now faded to tan) to evoke spiritual awe and splendor. Hampton’s symbolism extended even to his choice of materials such as light bulbs, which represent God as the light of the world. Praised as America’s greatest work of visionary art, Hampton’s Throne reveals one man’s faith in God as well as his hope for salvation. Although Hampton did not live to initiate a public ministry, the capping phrase “FEAR NOT” summarizes his project’s universally eloquent message. On DVD – Rare Visions and Roadside Revelations, “Eastern Weaseling”, KCPT, Kansas City Public Television, 2002. “Black Folk Art in America 1930-1980” by Jane Livingston and John Beardsley, published for the Corcoran Gallery of Art, 1982. “Souls Grown Deep: African American Vernacular Art of the South”, Vol 2, Arnett, et al, 2001.